Use our collection of resources on architecture to help students better understand how structures help define societies. It’s the main building of the Luxor Temple complex, which sits on the east bank of the Nile River in the city of Luxor, Egypt. The temple was constructed about 1400 BCE, in the early New Kingdom period in Ancient Egyptian history. Take a look at the facade of the Luxor Temple here. What surprises you about the reconstructed rendering? Maybe that such large portions of the monumental stone architecture survived? The temple was constructed with Nubian sandstone, which was also used at the temple’s famous sister site, Karnak, and in statues such as this one of Mentuhotep II. Although sandstone is relatively brittle, Egypt’s arid climate allows it to survive. Learn what other delicate material survived Ancient Egypt here. It’s the Parthenon, a temple to the Ancient Greek goddess Athena. It sits on the Acropolis of Athens, Greece. The Parthenon was constructed about 438 BCE. Take a look at the Parthenon here. What surprises you about the reconstructed rendering? Maybe the use of color? Ancient Greek and Roman buildings and statuary usually appear as white marble. In antiquity, that marble was painted in vivid color. Download a suite of “Classical Coloring Pages” here. Maybe how the inner temple is enclosed? Surviving temples from Ancient Greece are often limited to rows of columns on an open floor plan. The columns of the Parthenon surrounded an enclosed temple, which held an enormous (11.5-meter, or 12.5 foot) ivory and gold statue of the goddess Athena. Learn more about the interior of the Parthenon here. It’s the Temple of Jupiter in the Ancient Roman city of Pompeii, Italy. The Temple of Jupiter was constructed about 150 BCE. Take a look at the Temple of Jupiter here. (And take a look at that quiet mountain in the background.) What surprises you about the reconstructed rendering? Maybe that there’s so much to render? Unlike most other structures on this list, the existing ruins of Pompeii’s Temple of Jupiter leave a lot to the imagination. The temple was nearly destroyed by an earthquake in 62 CE. Worship moved to a smaller temple, and the Temple of Jupiter was still under construction when the catastrophic eruption of Mount Vesuvius in 79 CE buried the entire resort town in thick layers of volcanic ash and pumice. (That’s Vesuvius in the background.) 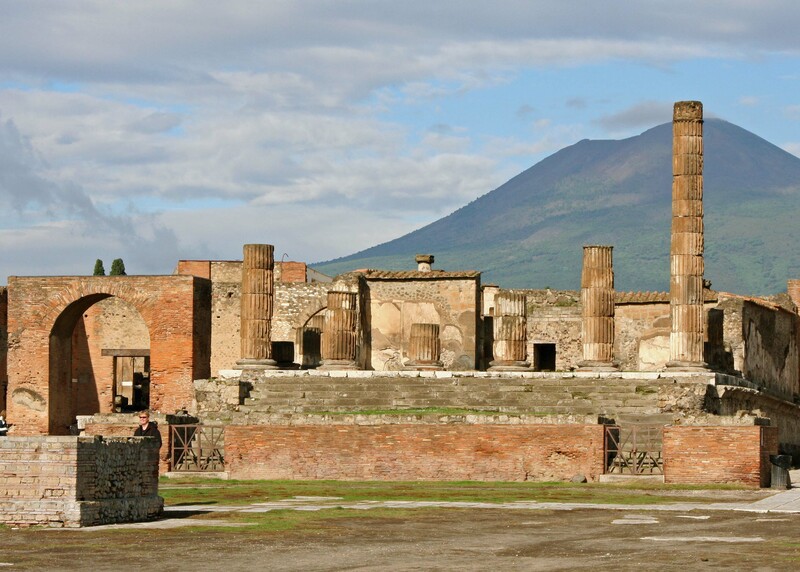 Learn more about Pompeii and the 79 eruption here. Maybe that it looks so much like Ancient Greek temples (such as the Parthenon)? Ancient Romans were heavily influenced by both the architecture and religion of Ancient Greece. Like the Parthenon, Pompeii’s Temple of Jupiter featured a colonnade surrounding an enclosed temple. Like the Parthenon, the temple featured statues of the gods to whom the temple was dedicated. Even the gods were influenced by figures from Ancient Greece. The gods in the Pompeii temple were the “Capitoline Triad”: Jupiter (corresponding to the Greek Zeus), Juno (Hera), and Minerva (Athena). It’s “Temple B,” one of four temples in the Largo di Torre Argentina complex in Rome, Italy. The temple, dedicated to an aspect of the goddess Fortuna, was constructed about 101 BCE. Take a look at Temple B here. What surprises you about the reconstructed rendering? Maybe that it’s a circle? 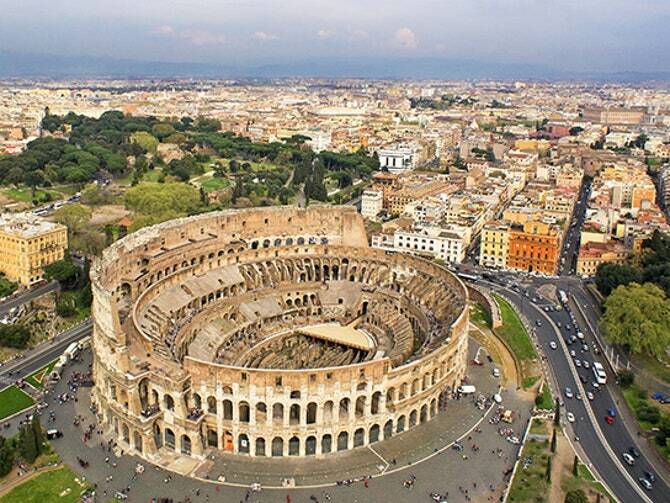 Most ancient structures are squares, rectangles, ovals (such as the amphitheater at the Colosseum) or half-circles (such as amphitheaters serving as theaters.) However, Ancient Romans did create circular structures, the most famous probably being the Pantheon in Rome. (Although the Pantheon, unlike Temple B, has a square porch, called a portico, in front of the structure itself.) Learn more about Ancient Rome here. It’s the Pyramid of the Sun, the largest building in the Teotihuacan complex near Mexico City, Mexico. The Pyramid of the Sun was constructed about 100 CE. Take a look at the Pyramid of the Sun here. What surprises you about the reconstructed rendering? Maybe its sheer size? The Pyramid of the Sun is easily the largest structure on this list. (Take a look at the people in the image for an idea of its scale.) The pyramid rises 71 meters (234 feet), and has a perimeter of 795 square meters (8,555 square feet). The city of Teotihuacan itself had more than 100,000 residents. Learn more about how the Teotihuacanos spent their time here. Maybe that it isn’t Aztec? Teotihuacan was a pre-Columbian city-civilization that largely predated the arrival of the Aztecs in the Valley of Mexico. Aztecs did, however, claim a common ancestry with Teotihuacanos and adopted aspects of their civilization. In fact, the “Pyramid of the Sun” and “Teotihuacan” are an Aztec words—archaeologists don’t know what the Teotihuacanos called their pyramid, or themselves. It’s Milecastle 39, also known as “Castle Nick,” a waypoint on Hadrian’s Wall in northeastern England. Hadrian’s Wall was constructed between 122 and 130. Take a look at Milecastle 39 here. What surprises you about the reconstructed rendering? Maybe that it was attached to a wall? Hadrian’s Wall is a massive Roman fortification that stretches across the north of England, from the Irish Sea in the west to the River Tyne (an outlet to the North Sea) in the East. Milecastles were built about every Roman mile (roughly 5,000 feet—not far off from the modern mile of 5,280 feet) along Hadrian’s Wall. Milecastles guarded gateways through the wall, and were staffed by garrisons of about 20-30 soldiers. Learn what life was like for a Roman soldier on the outskirts of the empire here. It’s the Nohoch Mul Pyramid, part of the Cobá Group of ruins in Quintana Roo, Mexico. Cobá is a major Mayan complex, thought to have been constructed in the Late Classic Period of Maya history, about 500 to 900 CE. Take a look at a Mayan city here. What surprises you about the reconstructed rendering? Maybe the geography? The pyramid seems to arise right out of the jungle of the Yucatan Peninsula, a difficult terrain to landscape and survey. During the Mayan period, Cobá and other cities relied on a network of raised roads and highways (called sacbes) to connect trading centers, population areas, administrative and spiritual centers, and quarries where construction material was excavated. Learn more about Mayan cities here. What ancient ruins would you reconstruct using rendering technology and a lot of research? Browse through our resource on civilizations for some ideas. The Mausoleum of the First Qin Emperor and his Terra Cotta Army? Learn more here. Ancient Cahokia, one of the largest pre-Columbian cities in the Americas? Learn more here. Great Zimbabwe, seat of the magnificent Kingdom of Zimbabwe? Learn more here. 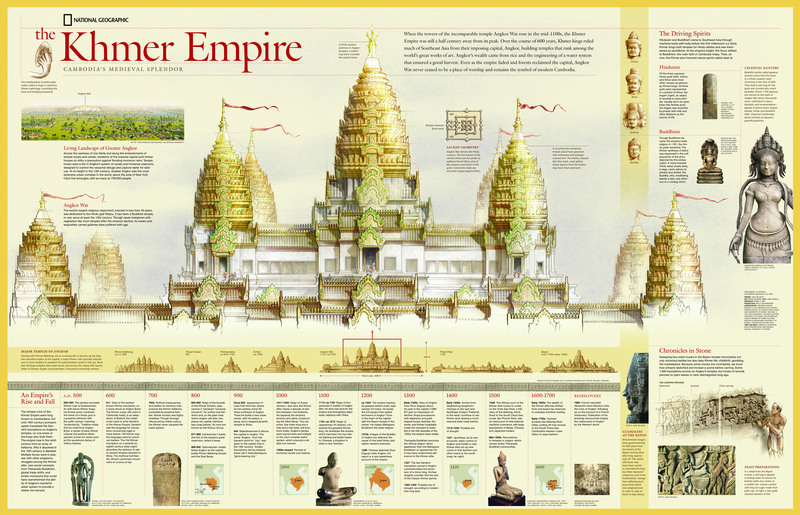 Angkor Wat, one of the largest and most complex series of shrines in the ancient world? Learn more here. The Palace at Knossos, the center of Minoan culture? Learn more here. Machu Picchu, the refuge of ancient Incan kings? Learn more here. Nat Geo: What is civilization?